Our Top Rated Foundation Girl producing the finest fleeced animals in our herd! 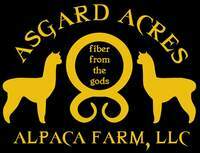 Asgard Acres is proud to be the new co-owners of HEAVEN'S Hill MERCUCIO. We chose this terrific guy due to his outstanding genetics and for his fabulous personal attributes. This full Peruvian boy caught our eye with his beautiful head and conformation. Then we looked into his super-fine (17micron) and dense fleece and we knew he was something special! And we are not the only ones - to date MERCUCIO has been awarded 5 Banners for his excellent architecture with its high frequency and strong amplitude crimp from skin to tip. "His bundles are small and clustered like nothing we have seen before....just fantastic" - Tim Lavan. 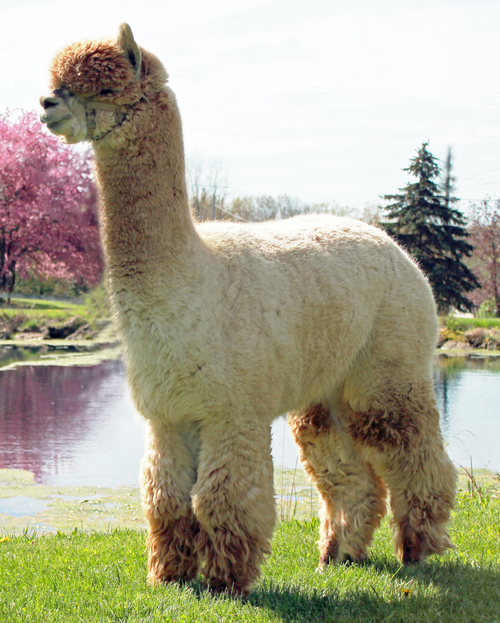 MERCUCIO was born on the Heaven's Hill Alpaca Farm to their Peruvian Meagan - a girl who at 8 years of age still sports an 18 micron fleece!! This is an attribute that our industry really needs to consider - alpacas that can maintain their fine fleeces for years to come. His sire is Titan's Mercury Rising, son of the renowned 6Peruvian Accoyo Titan! COLOR CHAMPION - 2011 Carolina Alpaca Show - (Wade Grease) "toughest class of the day" ... "fantastic presence on this young male with the fineness, density, architecture and consistency that makes a strong champion". FIRST - 2011 MAPACA - (Jill McCleod) "Very fine and the densest fleece in the class." COLOR CHAMPION - 2010 OABA Alpacafest - (Tim Lavan) Largest color class in the show. "Finest in the class with outstanding architecture consistent throughout his entire coverage. " "Not difficult to select the Champion in this class!" RESERVE COLOR CHAMPION - 2010 Best of the US - (David Barboza) "This guy is consistent from head to tip... just a beautiful guy!" RESERVE COLOR CHAMPION - 2010 Maryland Celebration - (Jude Anderson) "Strong presence, substance on bone with bright, fine and consistent fleece.."
FIRST - 2010 MAPACA - (14 in class) Diana Timmerman - "this boy just stands out in the class - he is fine, well defined, and consistent throughout his coat." FIRST - 2010 VAOBA - (Amanda Vanderbosh) - "Finest and most consistent - upright and perfect conformation. Beautiful future herdsire for sure!"